The 14043-000-55 backrest from K&M attaches to a variety of drum thrones to add back support. It can be used with the 14015/14016, 14055/14056, and 14052/14053. 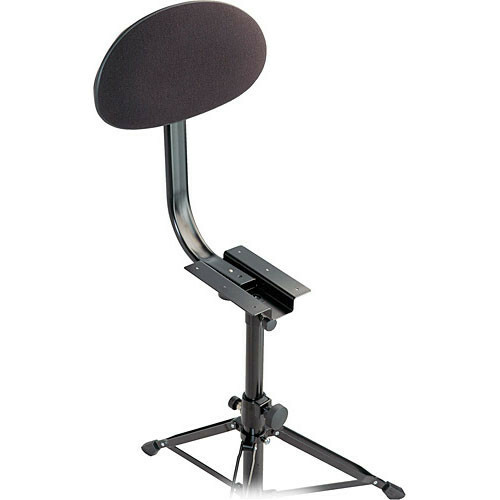 It has a comfortable oval cushion covered in black fabric, and is adjustable in both height and distance from the seat. Box Dimensions (LxWxH) 18.6 x 13.0 x 4.0"
14043-000-55 Backrest for Drummer's Throne (Black Fabric) is rated 4.0 out of 5 by 1. Rated 4 out of 5 by Terry from Solid add-on to the K&M throne I got this backrest as a complement to my K&M super adjustable throne. I have been looking for a solid, high, throne for my video work. I shoot concerts and it is not uncommon for me to need a comfortable high perch with adjustable foot rests from which to work for two hours at a time. The K&M fills the bill perfectly except for the high cost of admission. This combo is perfect for video work and keyboard players. Nothing else I've tried has come as close to perfect. Considering this gear will be in use for years I simply had to amortize the cost over the expected use. By those standards it's a no brainer. It is heavy duty stuff though, so, plan on the weight that goes with this solid construction.